One game in, Joey Bart looks like a seasoned veteran. In his Northwest League debut, the Giants' first-round pick collected three hits, including a pair of homers, and four RBIs to power Class A Short Season Salem-Keizer to a 15-1 win over Hillsboro on Wednesday at Volcanoes Stadium. "I was just trying to jump on it in the zone," Bart said. "They were throwing a lot of breaking balls out of the zone. I was trying to see some balls well, not do too much and put a good swing on it and capitalize on a few." After reaching on a fielder's choice in the first inning against D-backs third-round pick Jackson Goddard, Bart stepped back into the batter's box in the third against left-handed reliever Bryan Valdez, pounced on a 1-0 offering and sent a two-run shot over the left field fence to score Kyle McPherson. "I knew that this was the same game, it's just a different city," Bart said. "You just have to go out there and play your game. I want to stay in my hitting zone and do some damage and have fun. You want to connect with [your] pitcher behind the plate as well, and it was pretty clean tonight, it was a good one. We have another one tomorrow to look forward to." The second overall pick in last month's Draft singled to left in the fourth and grounded to second to end the fifth. He got another crack with one out in the eighth and crushed a 1-0 pitch from righty Kyler Stout over the right field wall. "Tonight, being Fourth of July, it was all really cool," Bart said. "I just take my game to the next level where I can. It was great tonight. It was special and I'm glad we scored a lot of runs." Along with his success at the plate, the 21-year-old said he was focused on adjusting to the higher level behind the dish. "I thought we did really well pitching -- they scored only one run," he said. "I can try to remember the way some of these guys throw and their strengths and what they bring to the mix for the next outing. That's basically what I'm here for, to control the pitching and the game from behind the plate. The hitting is there, it's important, but moreso my job behind the plate, so that also takes some pressure off." Bart batted put up a .261/.320/.391 slash line in six games in the Rookie-level Arizona League before moving up a level. The Georgia Tech product tripled and doubled for his only extra-base hits in the AZL, making Wednesday's blasts his first two as a professional. "It was a lot different," Bart said of switching leagues. "The atmosphere is a little different. The weather is different, it's a lot cooler up here. It was cool playing in front of some fans, I'm glad to be up here in Salem-Keizer." 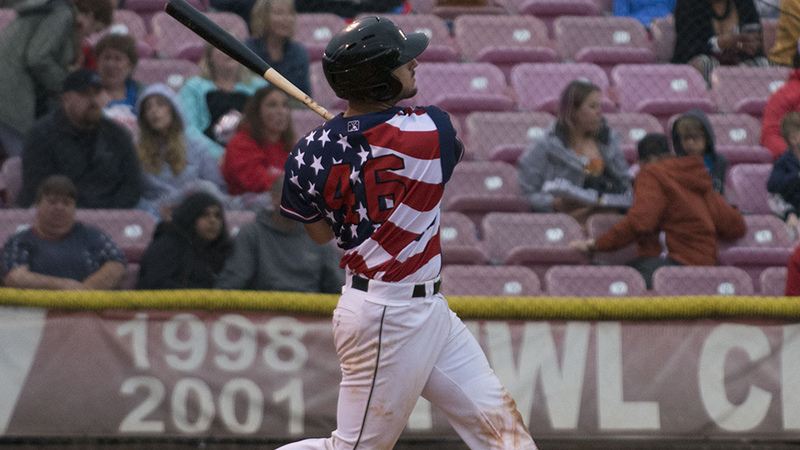 McPherson finished a single shy of the cycle and also drove in four runs for Salem-Keizer, while Northwest League batting leader Diego Rincones went 3-for-5 with an RBI to boost his average to .389. Reliever Solomon Bates (2-0) -- an eighth-round pick last month -- tossed two hitless innings for the win, striking out two and walking one. Third-rounder Jake Wong started for the Volcanoes and gave up one run without allowing a hit over two frames. Jorge Perez drove in Hillsboro's lone run with a first-inning groundout.